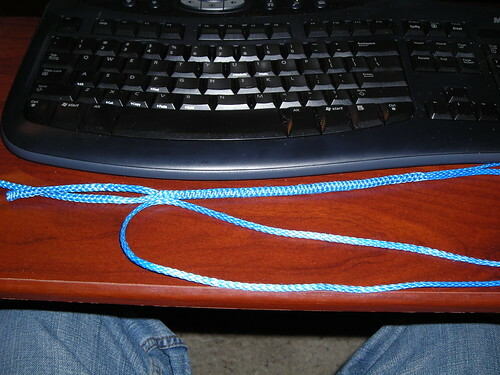 As I work out a good way to hang my hammock with a minimum of knotwork (that derates the cord and is complicated to tie, especially in the dark) and metal hardware (that’s heavy), I settled on whoopie slings. Grizzly Adams from Hammockforums has a nice video that does a good job of explaining how they work. 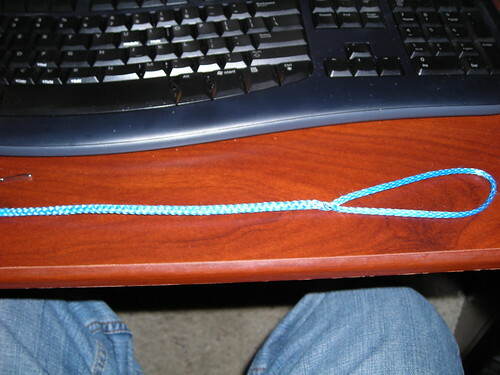 SlowBro also has a pictoral on how to make the whoopie sling. That’s great, but the whoopie sling is only one end of the rope! What do I do with the other end? 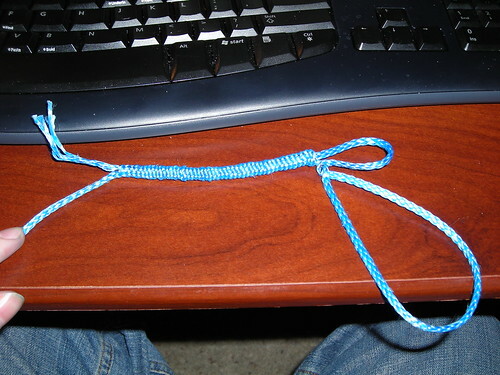 Here I am back to tying knots…or not. 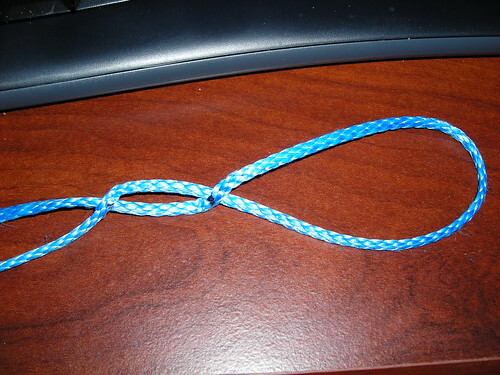 I stumbled across the locked brummel, which is an elegant method to create a fixed loop at the other end of the rope without any knots. Since I have aluminum SMC rings at the ends of my hammock, I can use this fixed loop to attach to the rings with a prussik and then use the whoopie sling over a toggle on a marlinspike hitch to attach the whole mess to the webbing tree straps. I set out to make my first one. No pictures here since it was an experimental affair. 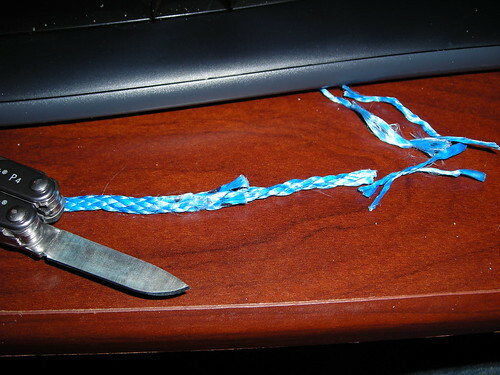 The whoopie part went well, so I cut myself a full length of rope to make one for real. Then I made my whoopie (whoops!) before I did the fixed eye loop. 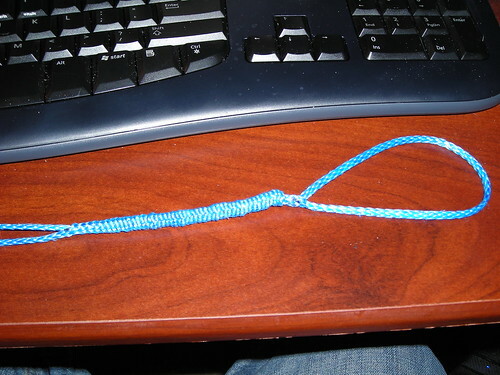 I learned the hard way that doing the whoopie sling first makes it harder to make the fixed eye loop. I can’t explain why unless you’ve done it yourself. Try it out and you’ll see why it’s tougher. On my next one, I took pictures so I can better explain how it’s done. First order of business, TOOLS! Yes, you’ll need tools for this one. Nothing expensive, mind you. But unless you’ve got a knitter or sewer in the household, you’re unlikely to have all of them. A large needle. The one I use is from a “Homecraft Assortment” of needles from Walmart, and specifically the one for Sacks. 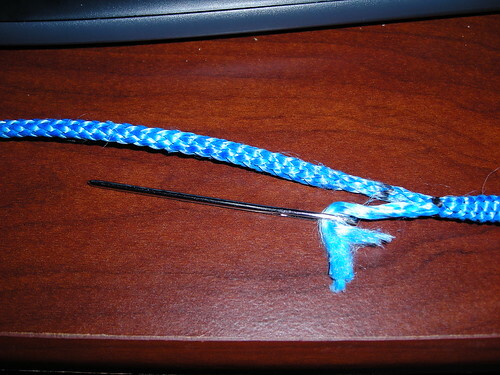 Others use a “darning needle” or a piece of steel (not the wound stuff) guitar string. Sharp knife or scissors. Sharp is the key word here. 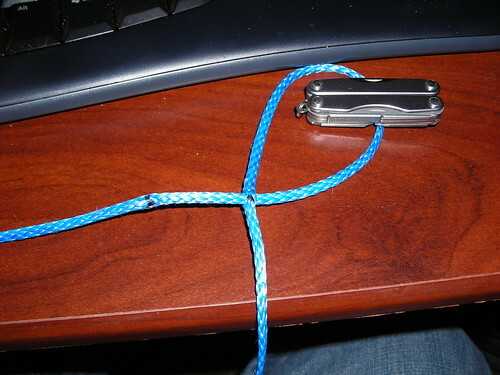 Amsteel cord is made of Dyneema fibers and it’s some really durable stuff. You need a monster knife or good scissors to cut it. Wimpy scissors won’t do anything to it. Sharpie marker for marking lengths and identifying threads to remove from the ends of the cord to taper it. 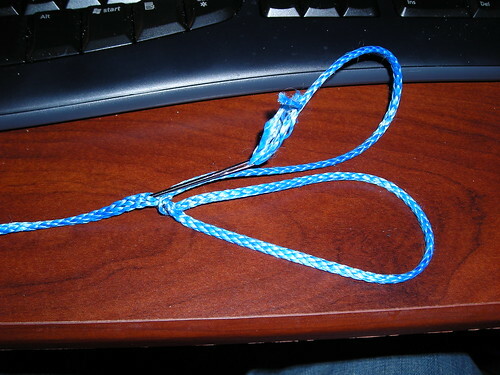 I used 7/64″ amsteel cord for my hammock. I’m not an especially heavy guy, so the smaller stuff is plenty strong for me. At most, you’ll need the 1/8″ stuff. It’s a bit stronger if you’re a heavier hanger or if you want to hang tandem. Also, you can find the 7/64″ stuff a fair bit cheaper I noticed. 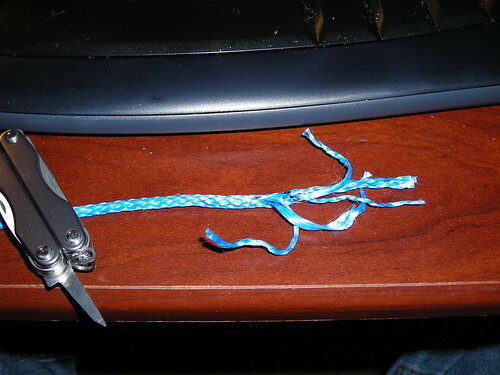 Please note that the smaller cord I used has fewer strands than the 1/8″ cord. My demonstration of removing threads at the end is for the smaller size. If you use a larger size, you will need to remove more threads. 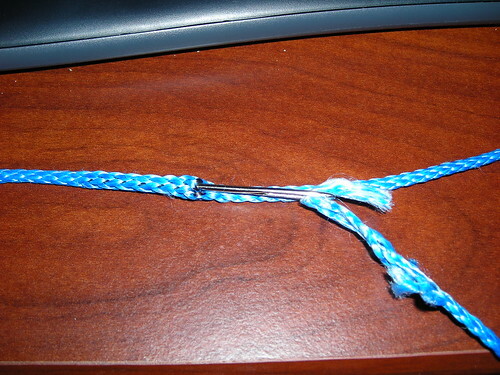 If you use 1/8″ cord, you should remove six strands instead of the four I remove. Follow the same pattern, of course. Step 1: How long do you want your cord? 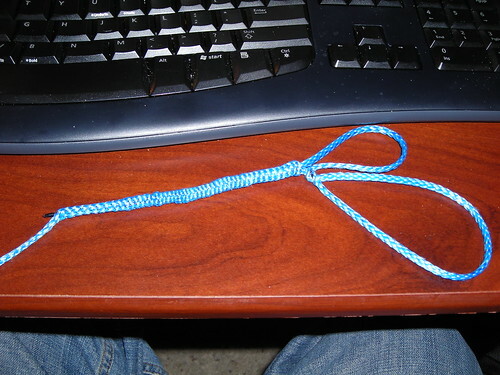 The way the whoopie sling works is that pretty much the entire length, the cord is doubled. So you kinda need to figure your maximum length FIRST. Mine are just shy of 7ft long in total (whoopie + fixed eye). The step I screwed up before, I should have done the fixed eye first. It works better this way. First, measure for your fixed eye loop. If you watched the video above, you understand how constrictors work. So I’ll spare you the explanations. You want to measure the length of your bury FIRST. 10″ is the recommended length, so that’s what I measured. Mark with the sharpie at 10″. Next, you want to know how much loop. 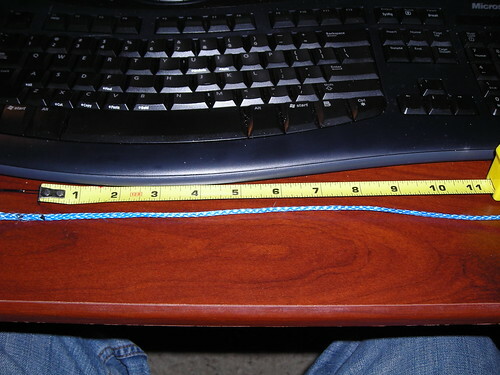 I went with 10″ of loop as a rather arbitrary length. I knew I wanted enough loop in order to make a prussik. That’s about it. You could make yours longer or shorter, no biggie. 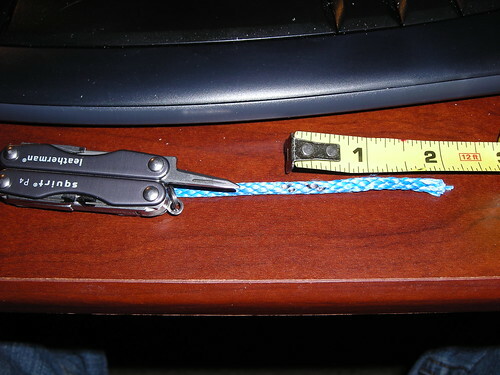 I also measured a second bury length of 10″ because I use the needle rather than the guitar string so I know where my needle is supposed to exit the rope. You also need to know how long your whoopie sling will be at this point, too. That’s because you will use that far end of the rope at one point in making your fixed eye. You’ll need to have that end cut if you are working from a very long section of rope. For the whoopie sling, start close to the end of your bury for your fixed eye. You could start farther away if you wanted your whoopie longer, but chances are you won’t need THAT much length. Mark the exit point of the bury. Since you need about 10″ of bury, mark the entrance of the bury about 10″ later. Now you need to measure the ‘maximum’ for your adjustable loop for the whoopie. I measured for a 5′ loop, so I added 10′ of cord (remember the rope doubles on itself). Next, you need to measure for your bury again, so add 10″. Finally, you need some extra to make the tail you will grab to make adjustments. I added 6″ for mine. 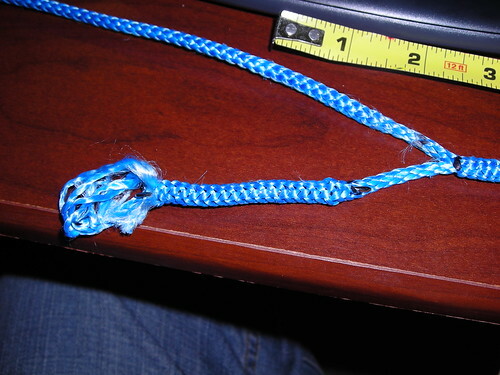 Once you get this all measured up, you can cut it from the spool or your pile of extra rope. It’ll now be a little easier to work with. The reasons for doing the taper are well outlined in the resources I point out above (video, links), so I won’t explain here. But, since I used a needle, I need to taper now (to fit the end of the rope through the eye of the needle). If you use a guitar string, you can taper later. 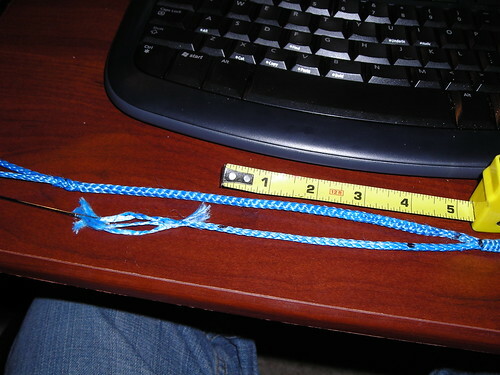 Measure about 2″, and then mark the strands of the rope like this. This is for 7/64″ cord. If you use 1/8″, you need 3 sets of strands. Pull the marked strands out, being careful not to split the adjacent strands. Now cut those strands off (this is where a sharp knife or scissors comes into play). Now, thread the end through the SECOND mark you made. Remember, the first mark is for the bury, and the second is for the loop. Pull the rope through until your first mark passes through. 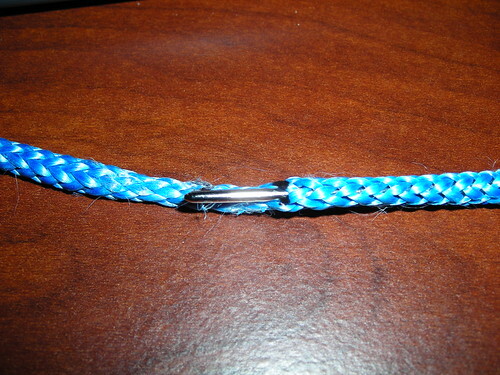 In this picture, the horizontal rope passes THROUGH the vertical one. The horizontal piece will be the short end. The vertical piece dropping down the bottom will be long and will be where you make the whoopie sling later. Grab the end of the longer piece and thread it through the FIRST mark (I tapered here already to fit the end into the eye of my needle. You don’t HAVE to taper here yet). Pull that long end through until it looks like this. 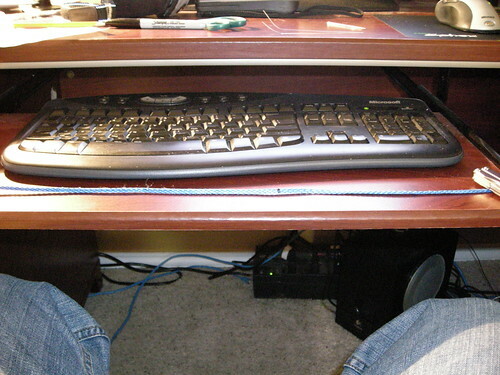 The two ends go to the left in this picture. The long end is on top. The short end is on the bottom. The funky twist in the rope is because this stuff is sorta flat. Continue to pull on the long end, and also on the loop. You will see the other loop you created start to shrink. 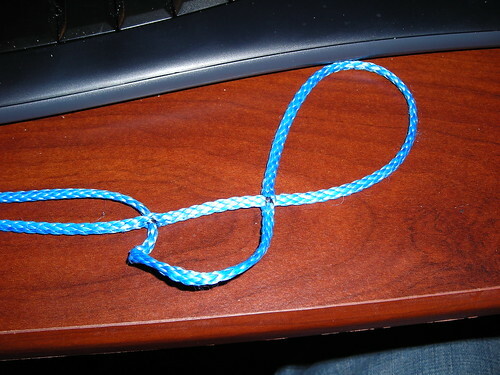 Keep pulling until that other loop disappears and your rope looks like this. Now it’s time to bury the short end of your rope to make it look clean. 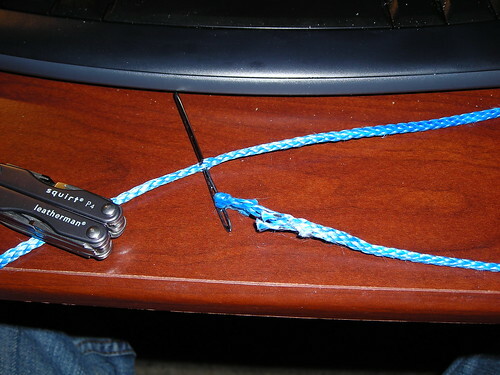 Get the short end and insert it into the rope as close as possible to the “lock” on your loop. You don’t want it to snag and pull the bury out (the bury helps hold this all in place). You can fit your needle inside because Amsteel cord is a hollow core rope. 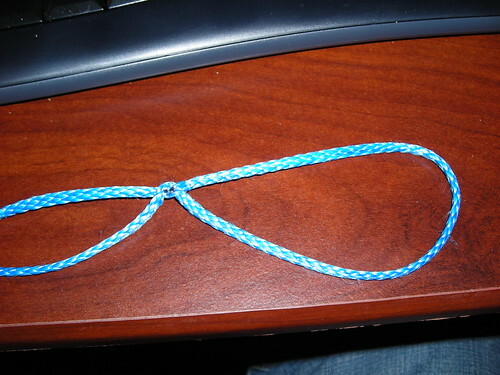 The pictoral I linked to above shows how to do this with a guitar string. I found it helpful to mark 10″ from this point (a THIRD mark) to show me where I need my needle to exit. 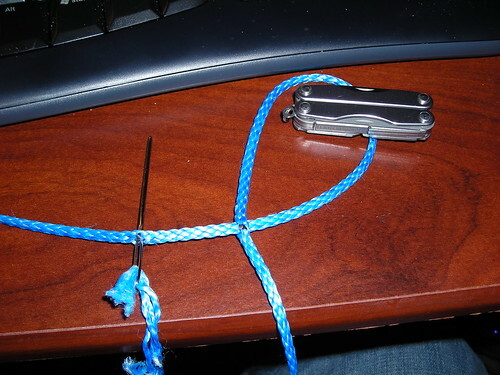 Compress the rope to open up the core to fit your needle and the rest of the rope into the middle. The needle exits at the third mark, though you can’t see it here. Pull the tail of the cord through the length of the bury. Decompress the rope, or “milk” it to completely hide (or bury) the tail. Fixed eye loop complete! Now for the whoopie sling part of this. Here you measure the bury you will need. Again, 10″ is the recommended length of the bury. The faint mark on the far left is the end of the bury for the fixed eye loop. Just to the right of that is the “exit” of the whoopie bury. Measure 10″ from there and mark the “in” for the whoopie bury. Take the tapered end of the cord and insert the needle into the “in” mark. Compress the rope and push the needle through to the “out” mark. Pull several inches through. This end you’ve pulled through will be your finished end. If you like, you could put a small non-load bearing fixed eye loop here and attach it to some sort of a pull. I’ll show you a simple and lightweight way to finish the end so it won’t pull through that bury you just made. A couple inches from the end of the cord, mark an “in” point. Then, about 4″ later, mark the “out” point. Thread the rope back through itself. This process makes it too fat to pull back through the bury. The finished product. Since mine’s about 7′ long, it’s too long to show all the detail here. But, the whoopie sling extends to the right and loops back around. You see the bury, and you see the short, fattened finished end you can pull on to adjust your whoopie. The fixed eye loop extends to the left off the frame. Thanks for the great tutorial. Just made a set for my HH and couldn’t be happier. Your instructions were excellent!